“The devil deprives some people of this scriptural relief by mere laziness. They complain about doubts and fears like sluggards crying out of their poverty as they lie in bed. But they will not get up and search the Word for the satisfaction of their need. Of all others, these sell their comfort most cheaply. Who pities the starving man who has bread before him but refuses to move his hand to take it? You can check out my review of this book by clicking here, and you can read the first set of quotes I shared by clicking here. And be sure to follow me on Twitter or Tumblr for more inspirational quotes posted every day. Christian, are you ready to do spiritual battle? You need to make sure you are properly equipped with all the armor God has for you. 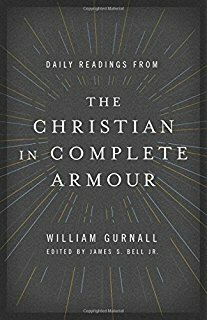 Check out my review of William Gurnall’s The Christian In Complete Armour by clicking here, and then enjoy this first set of quotes. I will be sharing more quotes from this book soon. 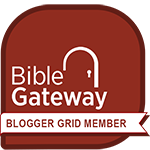 To be notified as soon as those quotes are posted, be sure to subscribe to my blog. In the meantime, every day I share inspiring quotes on Twitter and Tumblr, so make sure you follow me there too! “The fundamental truths of the Gospel are landmarks to keep us safely within the boundaries set by God. Suppose your grandfather owned some property which at one time had been carefully surveyed. He was there when they set the stakes and could have paced it off blindfolded. But he never took the time to show anyone else the markings. “Over the years, the markers rotted, were rooted up, or washed away. Now your grandfather has died and left the land to you. But a dishonest neighbor claims it is his, and as proof of ownership points to the burgeoning crop of corn he has planted. You discover the deed and land description have been lost. Since you do not really know the proper boundary lines yourself, how will you defend your case in court? You will probably end up losing your property because no one ever told you where it ends and your neighbor’s begins. I have shared other quotes from The Christian In Complete Armor here, here, and here.